20. Toledo Zoo Pumpkin Path Day 2, Toledo Ohio, October 22, 2017 - 4 hours I was able to join in on the second day of this thankfully! We were set up along a Pumpkin Path just inside the entrance, taking photos and handing out candy to any and all who came by! The lunch break was a tad awkward eating in armor, but manageable in the end! Overall thoughts: I messed with the fans in my helmet a bit, but to no avail. Not an issue aside from noise, but I'm going to look into replacing them in the future. Non blaster-cam photos credit to Matthew R. Never learned who the fourth trooper there was, they changed separately from the rest of the group and didn't hardly say a word. Odd .-. Group photo! (Minus Vader) We split into two groups to make photo-taking go a little faster for the crowd. We recognized a bunch of familiar faces! For our fun we charged the outrageous price of a high-five for each person present! A loyal citizen of the Empire came up and asked to be "arrested" - Odd but not too out there for a photo! Group-ish photo with Vader! This is what my photo-taking looks like from another angle: dopey as all heck! We ran into the fearsome Darth Trooper! This kid had the time of his life talking to our Boba, who gave him a signed action figure and a trading card! Some friends of some of the other troopers stopped by for photos too! I do this every so often while taking photos for fun to shake things up a bit! Some times they notice right away, other times they don't notice till they're long gone! 19. Oddmall Toledo Day 2, Toledo Ohio, October 15, 2017 - 4 hours A little late in posting this troop but oh well! This was another round of Oddmall, like a few months ago but in a different location. After changing I was stationed near a combined 501st / Rebel Legion / Mandolorian Mercs table to pass out information and take photos. After a bit of this, other TKs arrived and I had a chance to patrol the show floor with our Boba Fett. Later on in the troop, I even ran into a friend from my college (BGSU) who I'd briefly spoken to about joining up. He's looking into an ANH TK himself as well as a few other non-armor costumes / kits. Overall thoughts: Everything worked well, but around the halfway point one of my fans shifted and started being noticeably louder. I'm thinking of replacing them soon if this persists too much in the future. Non blaster-cam photos credit to John W. Mostly-full group photo! Got the last TK in one this one! Three generations of Skywalker in one photo! Our Old Luke even greeted Kylo by saying "Look! It's my little disappointment!" "I shall call him mini-me" Had to bring out the Blaster-cam at least once! Old Luke is actually one of the people who mentored me through building my kit! Our hopeful new recruit Tanner! Huge thanks to the table staff, especially John here! He ran the table this time while waiting for an approval for his officer's outfit. Old Luke changed over to Greedo towards the end of our trop and brought along his TK boots as well! Post-troop meal! 18. Cantina Night, Cleveland Ohio, October 7, 2017 - 2 hours Last Saturday I finally had a chance to come home from college on Fall Break and was lucky enough to attend a troop! I went to an event called Cantina Night at The Cleveland Brewery. The bar was set up to be like the cantina scene from Mos Eisley, and some of the employees even had costumes to make it even more realistic! Everyone there was quite nice and understanding of the rule of no photos with alcohol. We even had a little fun when one employee (dressed as Greedo) started to mess with another (dressed as Ponda Baba) and I got to leap in with a Royal Guard and break it up while laying down glorious Imperial law! Overall thoughts: I got a minor test in of a trading-card box I bought from another member of my garrison. It fits on my belt and works quite well! I was rather happy with the troop, and look forward to my next one this upcoming Sunday! SIDENOTE: Soon after this troop took place the Royal Guard, Brandon, had his ESB Vader approved by this Sith Lord Detachment! If all goes well I'll finally get to troop with a Vader! Found this online of us with one of our awesome hosts! Not sure how noticeable it is here, but I accidentally blocked Greedo (right behind my head) almost completely out of this photo! Post-troop photo in the changing area! Indeed you would! I'm hoping to rival that number someday! Thanks! Best of luck on your approval! Thanks! Exciting times! 17. Summerfest, Lyndhurst Ohio, August 6, 2017 - 2 hours Today I took part in a troop at a local high school in Lyndhurst, Ohio. The troop featured a large variety of activities and other costumed characters. The crowd was fairly nice, but had one or two moments where situations got a little hectic and my fellow troopers came to the rescue. You know who you are, and thank you so much! Overall thoughts: I still need a better solution to the trading card issue, but it worked out well enough today. Otherwise, everything held up rather well! Photo with a bunch of people from the 501st and Rebel Legions as well as others that I originally met in Wizard World during my first troop! A photo with one of my mentors from when I was still building my kit! 16. WEPLcon, Willowick Ohio, August 5, 2017 - 3 hours Yesterday I took part in a smaller troop at the Willoughby-Eastlake library. It functioned as a smaller comic con with an array of vendors and artists at hand for the crowd to mingle with! I attended the con with a fellow TK. After kitting up, we wandered around the library for over an hour, taking a few photos here and there before meeting up with a guy from the Midwest R2 Builder's Club for a few photos with his half-completed R2. After a few more hours of this we decided to call it a day, as the crowd was starting to wind down. Overall thoughts: Everything held up rather well, but I had one minor issue. This was the first troop with trading cards, and the holder I have is a little wallet with only two pockets that I have to jam between my armor and my belt when not in use (not to mention how long this process took - 15/20 seconds total). I've found a workable replacement for this, but it won't arrive before I go off to college in a little over a week. If anyone has any ideas on where / how to get a workable trading card holster, let me know! Pre-troop photo! Blastercam 2.0 is back in action! Blocked the poster a bit, but still, your Empire needs YOU! Anyone a fan of Charlie's Angels? We found some valuable intel while on patrol... Not sure what to do with this green-screen shot. Any ideas? We even ran into a member of the First Order! Hoping to get a kit together myself in the near-ish future. The partially-built R2 from the Builder's Club! A familiar face from my 6th troop, Comic Heaven owner Jim! 15. Barnes and Noble Pop Culture Fest, Woodmere Ohio, July 29, 2017 - 3 hours It's a tad late in being posted here, but my latest troop took place at a Barnes and Noble in Woodmere, Ohio. As I got into the changing room, I realized I forgot my underarmor. After racing home to grab it (Yay super close troop again! ), I joined the others in kitting up. The event taking place allowed anyone to come in in full costume and enjoy a bunch of pop culture icons in the graphic novel and literature worlds (GoT, TWD, SW etc.). We stationed ourselves by the main door, taking photos with people who came in . After about an hour of this, we started roaming around the store, grabbing a photo here and there with both people and props. To wrap up the first half of our day we all took part in a game of Star Wars Trivia for the kids in attendance. After a brief break, my parents made a quick visit and got to meet a bunch of the other troopers. Following this, we made a trip next door to visit a bunch of people who had made a special request for a photo! To wrap things up for the troop itself, we walked up and down the strip mall that the store was located in, spreading the word about the event to anyone and everyone! After we kitted down, we held a special little birthday party for one of our rebels who trooped on her birthday! Overall thoughts: My helmet received its first crack when I tried to quickly take it off one-handed. Thankfully, this was hidden almost completely by the S-trim near the mic tips. It was an easy fix with some epoxy and mesh inside the helmet as additional reinforcement. First part of the troop photo! Our awesome handler and TK to-be Alex! We troopers are all prepared for battle! Blaster-cam 2.0 with the behind-the-scenes employees helping us out throughout the day! Full group of troopers, plus who I believe is snow Padme? Wasn't sure and didn't get a chance to ask. At the trivia event! We saw something that looked vaguely familiar! Guarding the front door! Next door taking some photos with friends! Even when leaning over I still wind up being the tallest trooper in the bunch! My parents made a special visit to meet the other troopers and to check out the event! Official final photo of the troop in the store before going to spread the news of the event! We were asked inside a local Apple store, but soon wound up getting a fair number of the customers there to follow us back to our troop before calling it a day! And there aren't any videos or photos available, but we had a bunch of cake afterword and enjoyed the exhaustion that follows an awesome troop! TheBlooperTrooper replied to Olaf's topic in Getting Started - Read this First! Welcome aboard! AM armor works for all levels in its current form - I'm currently EIB, and will likely stay there due to the rules on helmet decals. Best of luck on your build! 14. Orange Community Center, Orange Ohio, July 16, 2017 - 2.5 hours Yesterday I took part in a troop at the Orange Community Center. Compared to my other troops with hour plus, this was a rather nice 5 minute drive to the troop! We kitted up in a nearby firehouse dorm and went outside to take a few quick group and individual photos. After that, the event for children with Fragile X began. The crowd was small, but very into Star Wars, and was ecstatic about seeing us! We took a bunch of photos for awhile, then went inside for a brief break. After that, we went back outside for more photos with the children and the volunteers there. Following this, we weren't sure what was going on next, and wound up taking a bunch of photos with the kids and staff before calling it a day. Got two last quick photos with the other TK before packing things in and calling it a day. Overall thoughts: The troop was great, but one piece of padding came out of my helmet when I took it off while packing up. A very easy fix with some industrial velcro, so no long-term harm done. Everything else held up really well, although I might need to readjust the height of my thighs to be a tad bit higher based on the photos. Quick photo with the new guy! (RS Props kit on him) Blaster-cam back very briefly! Mid-troop break! I think we've found our newest recruit! 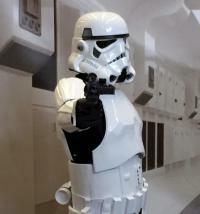 Our ever-official Imperial Gunner! Group photo with the volunteers and coordinators! The other TK had one or two of the stereotypical height questions asked. I think I'm the odd one out in my garrison, as there's maybe one or two people that I've trooped with as TKs that are my height or taller. We TKs possess some golden pipes! Odd deployments can lead to some odd transports, but it always works out for the best! As a kid I wanted to be a fireman, so I thought this moment was darn cool! Technically a pre-troop photo set begins here, but it fits better as a post-troop sort of thing. While the event itself was done with weapons, we were given the okay to use them for photos away from the crowd. The new guy in his shiny RS Props kit! Yours truly, ready for battle! I plan on using this as part of my Ohio Garrison trading card, which I will hopefully be getting soon! Trading card photo part two! Rather happy with this one! Bit of a status update: Removed the Anovos visor easily, but I'm having some difficulty getting the visor from VaderPaint to fit in the helmet. Seems a little oversized for the Anovos bucket. Looking into possibly having an optic shop cleaning the original visor to remove the warp effect. Would still prefer the VaderPaint one, as it is much easier to look through, but it's always good to have a backup. I'm also looking into a chin strap that loops through the spots where the hard hat liner was originally. Padding itself is quite easy, but I don't want to make any long term decisions until I can get the visor issue sorted. 13. New Philadelphia Parade, New Philadelphia Ohio, June 30, 2017 - 2 hours Yesterday I took part in a parade in New Philadelphia, Ohio. This was probably the warmest troop I've ever taken part in, with temperatures never going below 85 F, frequently creeping up to 90 F or higher. We kitted out in a nearby high school before securing our gear in our cars. We walked about half a mile to the parade route's start and started walking. I had tweaked my thigh strapping before the troop so I was able to walk quite fast along the route if required. Sadly anything beyond that would require trimming of the leg pieces, otherwise I'd just menacingly waddle everywhere. After about 2 hours of parading around, we reached the parade route's end. Important note: I was suffering from heat exhaustion by the end of this troop. If you don't already know the symptoms of it, click here to see them. Thanks to the actions of those around me who did recognize these symptoms, I was alerted to the issue and was able to quickly recover. Pre-troop photo: Mid-troop photo, was hoping to get the sun in the background but I'm still quite happy with the end result! Just a moment later, this time with the full group! 12. NSO Pops John Williams Concert, Kennedy Center - Washington D.C., 2.5 hours Last night I took part in a troop at the Kennedy Center along with members from the Old Line Garrison, Garrison Tyranus, Garrison Corellia, as well as some rebel Legion members and a very well-built R2D2. My family and I are in town on vacation, so a few weeks prior I looked up the local garrison calendar and found this troop. Everyone there was very kind and welcoming! We began the troop by taking a few photos where everyone was streaming into the concert hall, wrapping things up just as the first part of the performance began. Shortly before intermission, we took our places once again and took more photos, even one with the conductor, who is a HUGE fan of both the group and the saga. After this we kitted down and moved back to the concert hall one final time to listen to the Star Wars segment of the program. As we entered to take our seats, we even got a cheer from the crowd and a really nice compliment from the conductor! What followed was about an hour of the best music I think I've ever heard, not to mention a little encore of the Cantina Theme to round it all out! All in all, the friendly troopers, large crowds, enthusiastic and the National Symphony Orchestra combined to make one of the most memorable experiences I'll ever have! Huge thanks to the local troopers for being so welcoming! In terms of overall thoughts, my kit held up pretty well. One of my helmet fan batteries didn't work, but I had a backup that worked quite well in its place. Also, I noticed a minor armor bite in the return edge of my left forearm, which I can easily trim down when I get back home. Group photo! Might've accidentally blocked out the R2 owner and an Imperial Officer on accident. Got a photo from the other view as well! wish it could've been a clearer photo, but we had to run back to our room to kit down to hear the performance. Thanks for the visuals! I plan on doing the same thing and it's great to finally see what I'm doing!